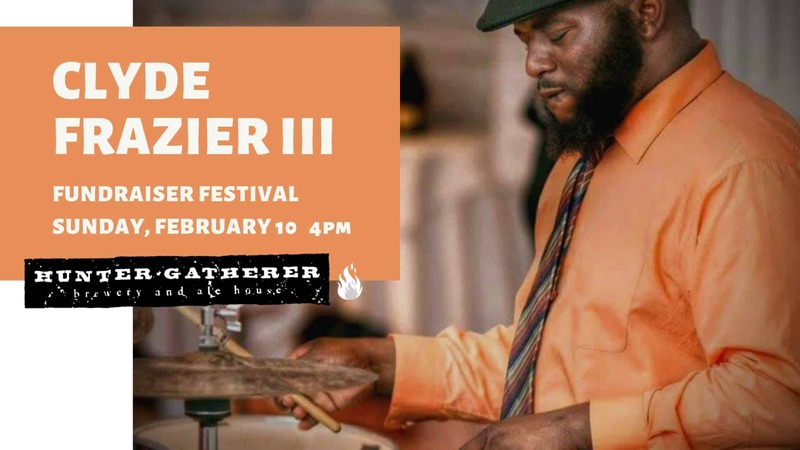 Join ColaJazz as we celebrate and raise funds for Clyde Frazier III on Sunday, February 10 at the Hunter-Gatherer Brewery & Alehouse Hangar. Clyde was in a near-fatal car accident and is on the long road to recovery. When a musician can’t play gigs, money doesn’t come in and bills add up fast. Let’s gather together and help one of our own. Great beers and food, friends & family and a whole lotta love in the air! Raising money to help Clyde get back on his feet. Hunter-Gatherer is donating 10% of sales to Clyde Frazier! Pecknel Music is donating a guitar for raffle! A drum head will be signed and raffled off!